Due to the nature of Fate/Grand Order: First Order’s story, there will be spoilers for Fate/Stay Night within the review. There’s no denying that the Fate series is now a bona fide, multimillion-selling franchise, but if you’re not a massive anime fan or follower of all things visual novel, the series could have fallen right under your radar. However, with multiple manga adaptations, countless game spin-offs, and successful anime after anime – TV and film – the Fate series is everywhere and is only getting bigger. This is largely in part to the mobile game, Fate/Grand Order, which has over 7 million users in Japan (out-grossing Pokémon Go within 51 days of its launch) and growing over 2 million users in America, with plans to expand the server to other countries. 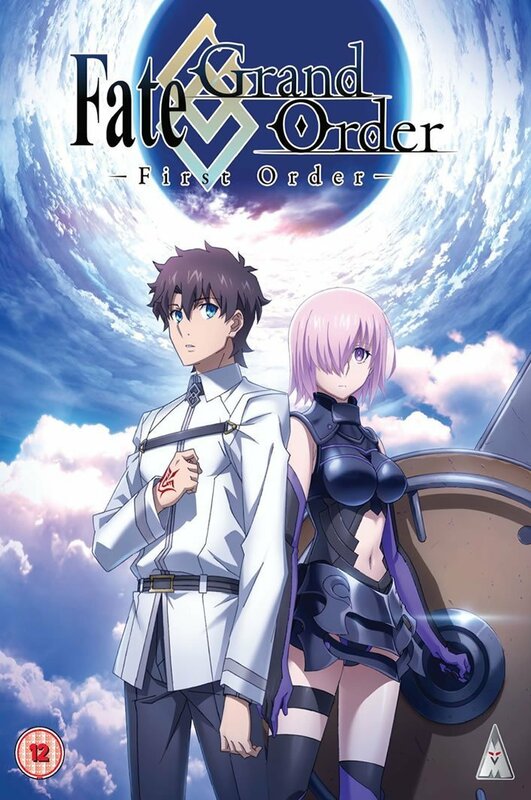 So naturally, a Fate/Grand Order anime movie was commissioned to help expand on its audience, and it’s ironic that with no word on whether the UK will be able to get their hands on the app itself, MVM kindly licensed the movie for DVD and Blu-ray. Fate/Grand Order: First Order opens on the Chaldea Security Organization: a hub high above the Earth that is home to many grand mages whose main goal is to ensure the future of mankind. However, one day, the Chaldea abruptly changes and predicts that the human race will become extinct by the end of 2018. The Organization is forced to enrol multiple mages with the potential to be masters into their fold, with the aim of sending them back in time to snuff out the source of chaos and save humanity. However, when the experiment goes wrong, only one boy, Ritsuka Fujimaru, and one girl, Mash Kyrielight, survive and are sent back in time to the point where the chaos began: Fuyuki City in January 2004. The film is based upon the mobile app game; however, the movie serves as a prologue to the app’s events, therefore you don’t need to know the game itself to understand what’s going on, however it isn’t exactly kind to newbies of the Fate franchise either. There’s a lot of exposition within the first 15 minutes that tries to cram in a lot of backstory to the world Fate/Grand Order, but most of it will either go completely over your head or not fully matter in the context of the film as it’s clearly more important to know if you’re playing the much longer and intense app game. It doesn’t help that the opening set of the film is very un-Fate like; it’s a futuristic lab that looks more like Neon Genesis Evangelion’s NERV headquarters than any Fate series that has come before. However, even when the plot finally kicks in and we move away from the lab, the main conflict still requires knowledge that only Fate fans will know. The most obvious is the importance of the place and date the world ending-problems stem from; it’s the release date of the very first Fate/Stay Night game, and the main conflict is akin to answering the question: what if one of the multiple bad ending in the Heaven’s Feel route came to fruition? 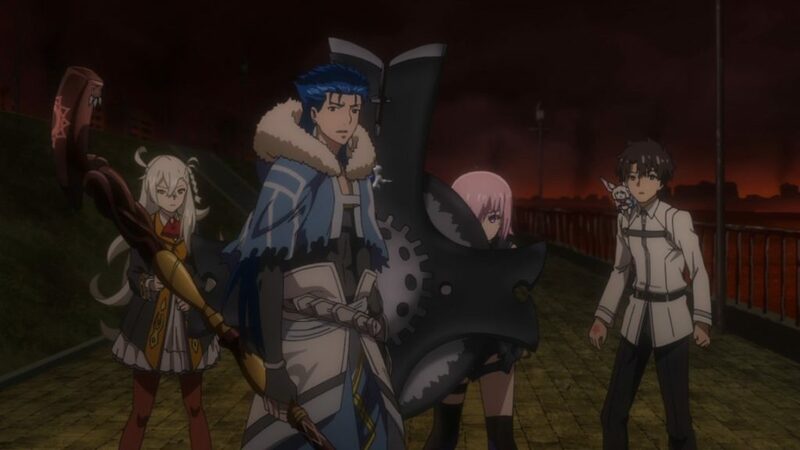 So, Fate fans, especially those who are fully knowledgeable of all the routes and world building, will love seeing a new darker take on the Fuyuki City’s Holy Grail War, and will understand why several of the Servants now look and behave differently – for example Lancer now in the role of Caster. Everyone else will either not get the fan service-heavy references or be completely lost as to what’s going on. If you strip away the Fate lore however, the plot itself is fairly straightforward; Master and Servant of the future must travel back in time to stop a bad thing happening to save future. As the movie is only 72 minutes long, it sticks around long enough to be enjoyable but without dragging its feet or outstaying its welcome. Despite taking place mostly within Fate/Stay Night’s timeframe, we don’t get a grand tour of the city or meet the old cast; we stick with our core characters and the Servants required for the battles as and when they occur. It works in the movie’s favour as it’s short running time doesn’t really allow for grand expeditions or detours that go off-topic of trying to save the world. As expected of a Fate property, there’s plenty of action and drama to be found; the most thrilling are the ones involving the Servants from the original Fate/Stay Night; with Caster and Lancer being reinterpretations of Servants from the original, it’s interesting to see them use their new powers and how their personalities work within their new roles. 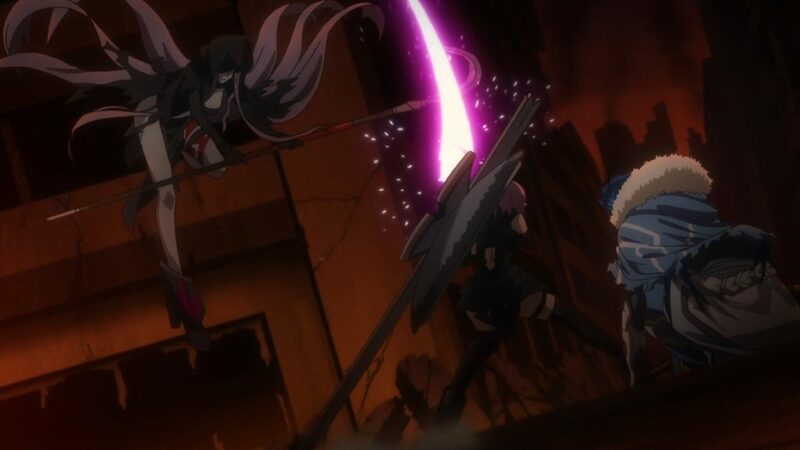 The fight between Caster and Lancer is the highlight of the movie, with Caster vs. Archer coming in close second. The new Servant, Mash, however is the weakest link as she just has a giant shield and stands there for all her fights. It’s understandable as she’s new to her powers, however watching her constantly take a beating with little to no attempt to try anything else is boring and even when she pulls out her grand power in the final battle it feels unearned and anticlimactic. Lay-Duce is a relatively new anime studio, formed in 2013 by former Bones members and only have a few titles under their belt, with Grand Order: First Order being the first Fate title they’ve handled. Overall the animation is competent; the character models are mostly consistent, the details to the various Servants are nicely handled and the big powerful moves that the Servants execute look impressive as expected. It’s no Ufotable production, but it doesn’t go way off-model like Apocrypha or Deen’s version of Fate/Stay Night did sometimes . DVD and Blu-ray copies of the movie come with the same extras; English and Japanese trailer with an English cast interview. The Japanese dub is also included. It’s a shame that this is likely (at the time of writing) to be the only way for UK fans to experience Fate/Grand Order in any form, but as a movie is meant to be a long commercial for the app itself, it’s not bad. It goes without saying that any non-Fate fans shouldn’t even bother with this movie, but anyone who is invested in the franchise will enjoy this little quick romp; with plenty of fan service, decent animation, interesting new take on a well-established story and fun to watch overall. The Fate franchise has produced over 12 years of anime material, but with over 10 different series and movies, where does a newcomer even begin? Anime UK News provides a beginner’s guide to the mega-franchise, to help you start on your Fate journey.